TOKYO (Bloomberg) -- Toyota Motor Corp. forecast profit will rise 48 percent this fiscal year as it recovers from record recalls in North America, its largest market, and boosts sales in Asia outside Japan. The company may increase net income to 310 billion yen ($3.35 billion) in the year ending in March, from 209 billion yen a year earlier, the automaker said in a statement today. 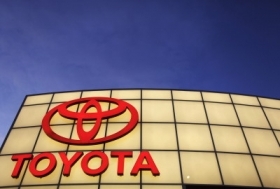 Toyota's U.S. sales rose 24 percent in April as incentives boosted demand for its Corolla and Prius models and offset the impact of recalls of more than 8 million vehicles worldwide for defects related to unintended acceleration. Toyota's North American sales may increase 1.5 percent this fiscal year to 2.13 million vehicles, the company said, as the region recovers from a recession. The company's sales in the United States surged 41 percent in March, after it introduced discounts across its lineup. Lost sales due to the recalls for the year ended in March amounted to about 50,000 vehicles, compared with an earlier estimate of 100,000, Toyota Senior Managing Director Takahiko Ijichi said at a press conference in Tokyo today. The cost of the recalls was between 170 billion yen and 180 billion yen, he said. While Toyota didn't say by how much the recalls will cut profit this year, related costs, such as a $16.4 million fine from the National Highway Traffic Safety Administration, are included in the forecast for the year ending in March 2011, it said. The company set aside an extra 100 billion yen in provisions for warranties last fiscal year. Still, the Japanese carmaker must fend off increasing competition in the United States from Ford Motor Co. and Hyundai Motor Co.'s new models, said Jessica Caldwell, senior analyst at Edmunds.com. Sales of Hyundai's revamped Sonata sedan, which was introduced in the United States in February, surged 57 percent in April. The model competes with Toyota's Camry sedan, sales of which gained 10 percent that month. Ford's April sales rose 26 percent. Competition in the U.S. is “intensifying” as American competitors have strengthened their passenger car lineups and Hyundai's presence is increasing, Honda Motor Co.'s Executive Vice President Koichi Kondo said on April 28. In the fourth quarter, Toyota posted net income of 112 billion yen, compared with a loss of 766 billion yen a year earlier. Toyota was projected to post 48.3 billion yen in net income based on the average of four analyst estimates compiled by Bloomberg. Sales for the quarter rose 49 percent to 5.28 trillion yen. The automaker predicts sales in Asia excluding Japan will rise 11 percent to 1.09 million vehicles this fiscal year. In Japan, its second biggest market, sales are expected to drop 11 percent to 1.92 million. In Europe, the company forecasts sales of 860,000 vehicles, an increase of 0.2 percent from the last fiscal year. Toyota also said it plans to review models and improve the efficiency of its production structure in Japan, North America and Europe.